Keeping your office sanitary is crucial to maintaining clinical standards. To help maintain a clinical quality surface on therapy tables, physical therapists purchase exam table paper rolls from e-current.com. Our premium quality, economical exam table paper offers protection to both your patients and your therapy tables. 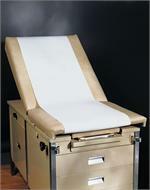 Exam table paper rolls are available in either 18” or 21” width x 225’ length. Exam table paper rolls are packed 12 rolls per case. 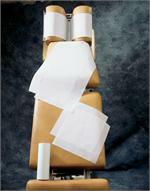 Similar in function to exam table paper, headrest paper rolls and headrest sheets are specifically designed to cover the headrest section of chiropractic tables. Headrest rolls measure 8.5” by 125’ and are packed 25 rolls per case. We also offer headrest sheets which are 12” by 12” and are available with and without a face slot. Headrest sheets are packed 1000 sheets per box. So whether you’re looking for headrest paper or exam table paper, purchase your medical use paper from e-current.com today.